After the Best of ’94 extravaganza from last issue, this column from Wizard #42, the February issue, can be considered the first “Palmer’s Picks” of 1995, even though it was published in the last week of December ’94. Confusing? Well, it’s even more perplexing when you consider that I wrote this column in October 1994. 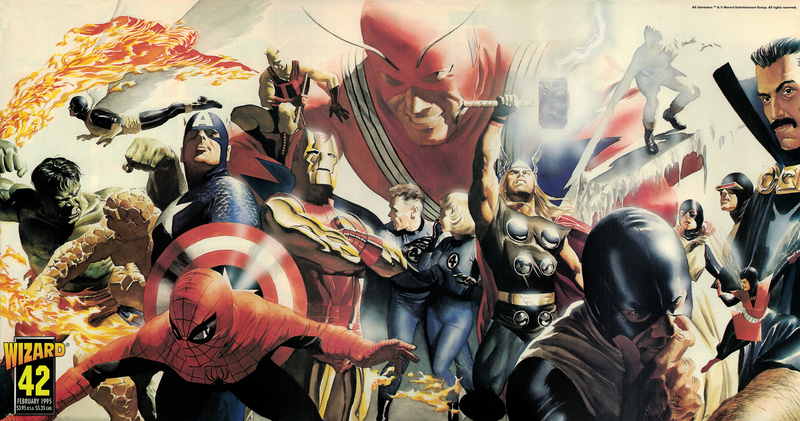 Legendary painter Alex Ross was still an up-and-coming artist when he produced his first covers for Wizard. 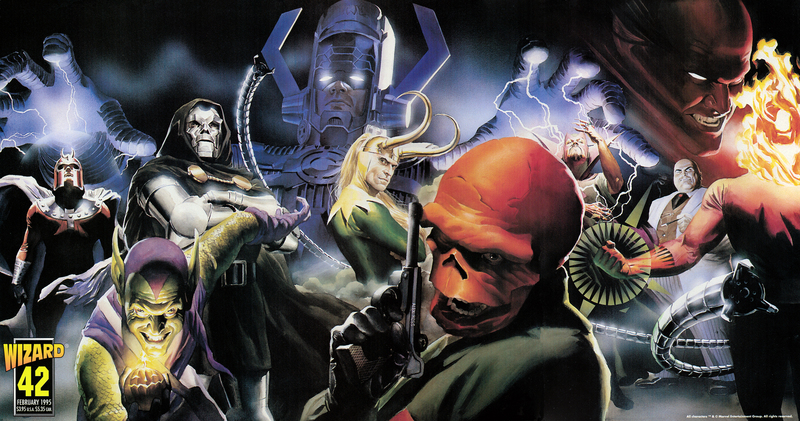 This one for issue #42, starring Marvel Comics’ classic villains, featured a triple-gatefold. Once you get past the mysteries of magazine cover dates, it’s interesting to note that I spent the first half of ’95 profiling six different self-publishers, starting with this issue’s profile of Very Vicky. (If you want a preview of the rest, here it goes: David Mazzucchelli‘s Rubber Blanket, Scud: The Disposable Assassin by Rob Schrab, Don Simpson‘s Bizarre Heroes, Adrian Tomine and Optic Nerve, and Bacchus by Eddie Campbell.) The streak of self-publishers runs even longer if you consider that I profiled Steve Bissette, Terry Moore, and Paul Pope in the three columns before Wizard‘s year-end issue. So what made self-publishing so popular in the 1990s? Well, the direct sales market at the time was really chugging along, so a creator who wanted to control all aspects of their comic was able to take advantage of a market that could still support a decent number of comic book shops and had a robust distribution system. This all changed when Marvel bought the third largest distributor in the tail-end of 1994 and set off a chain of events that destabilized the market and left Diamond as the only distributor by the middle of ’96. Self-publishers took a big hit when the market collapsed, but before that point it was a great option for artists who had a comic that might not neatly fit into a popular genre or could get lost at a larger company. Which brings us to Very Vicky. After publishing an issue of their comic at Caliber Press, husband and wife team John Mitchell and Jana Christy decided to start their own company to continue their quirky comic that took inspiration from the Rat Pack films of the ’50s and ’60s. The second cover for Wizard #42 featured a fold-out of Marvel Comic’s Silver Age heroes by Alex Ross, fresh off of his successful Marvels series with writer Kurt Busiek. As you can probably surmise, a comic like Very Vicky was probably the furthest thing from what the typical Wizard reader was interested in. Regardless, I think this column wasn’t half bad. My profile of Paul Pope from issue 40 was the first to feature a traditional interview (like, with quotes and stuff), so I was still getting the hang of the new format. Of course, I decided to complicate things for my second attempt by picking a comic where I would have to speak with two creators and weave their quotes together in one write-up. Very Vicky didn’t stick around much longer after this “Palmer’s Picks.” The initial series wrapped up with issue 8 in the summer of 1995 (six issues had been published when this issue of Wizard hit the stands), and was followed by two issues of a new series (Very Vicky: Calling All Hillbillies) and the Very Vicky Junior Hepcat Funbook, a collection of odds-and-ends and pin-ups from guest artists like Dave Sim, Steve Bissette, and Brian Michael Bendis. Mitchell and Christy have since moved on to bigger things, including a career in children’s books. They’ve produced a few together, including Frankie Liked To Sing, a biography of Frank Sinatra, which should appeal to any fans of their comic work together. Christy has also illustrated several books with other authors, including Disney’s Never Girls series, while Mitchell (who now goes by the name John Seven) has penned a few books on his own and enjoys a career as a journalist. It’s safe to say that Very Vicky is unlike anything being done in comics today. While the typical comic book is described by the other comics it resembles, Very Vicky can best be explained as equal parts ’50s screwball comedy movie, scathing satire of trendy teens, and celebration of the wonders of “responsible” drinking, with a small homage to the eternal coolness of Frank Sinatra thrown in for good measure. Vicky Ocean, the sixteen-year-old star of Very Vicky, is a hip New York girl who goes to live with her aunt and uncle in Sandy Shores, Georgia, a small beach town that claims to be “The ‘Buckle’ in the ‘Sun Belt. '” She’s a bit out of place with the other beer-drinking, uncultured teens, but she manages to bring her own sensibilities to the rest of the small beach community in a unique fashion. In the short span of a handful of comic books, she’s thrown the beach party to end all beach parties, with a guest list including Babblin’ Louie Hubbard, God, and the Devil; been in the middle of a feud between the Shriner Lodge and the Jellyfish Lodge; and gone on a madcap chase for a pot of gold a la the classic movie It’s A Mad, Mad, Mad, Mad, Mad World. The title character was a direct output of this close collaboration, as John explains. “She sprang out of our minds. I came up with the name first before anything else, and the first time Jana drew her, she looked pretty much like she does now, except she wore boots.” Boots or no boots, Vicky is definitely a recognizable character, with her distinctive, (mostly) black wardrobe and wry smile. Jana’s artwork does a perfect job of conveying the mad-cap goings-on in Very Vicky. At first glance, her drawings seem simple, but there’s more than just what lies on the surface. Upon subsequent readings, background jokes and details become apparent. Her artwork is so fresh because she cannot cite a comic book influence on her work. In fact, before they started working on Very Vicky, Jana and John tried, unsuccessfully, to break into children’s books. Obviously, that genre’s loss is comic books’ gain. Very Vicky is the talk of the industry, but John is a little wary of the attention that Very Vicky, and small press comics in general, have been getting recently. Very Vicky has been so well-received due to the fact that John and Jana keep it simple. With nothing more than biting, sarcastic writing, and eye-pleasing artwork, Very Vicky goes down like a smooth martini. And the best thing about it is that you won’t get a hangover in the morning. As always, please send any comments to me at Palmer’s Picks, 151 Wells Avenue, Congers, NY 10920-2064, and send any unusual cocktail recipes to John and Jana at the Meet Danny Ocean address below. Drawn & Quarterly—This high-class anthology is one of the few publications that actually cares about and respects comics as an art form. With its lavish production values and commitment to publishing the finest work from North American and European cartoonists, Drawn & Quarterly gives comics the attention they deserve. Pick up the second issue, which is out now, at your local comic store, or send $5.95 directly to Drawn & Quarterly Publications, 5550 Jeanne Mance, #16, Montreal, Quebec, Canada H2V 4K6. Tom Palmer Jr. is a freelance writer who is too young to order an Old Fashioned, and too old to order a Shirley Temple. Very Vicky: Very Vicky is a black-and-white comic published on a quarterly schedule, and the sixth issue is in stores now. The first issue, published by Iconografix, is sold out, but Meet Danny Ocean recently published a second printing. Every issue contains a main story by John and Jana, and a series of back-up features, including multimedia collage strips by Gregory Damien Grinnell. All six issues can be ordered for $2.50 each from Meet Danny Ocean, PO Box 383286, Cambridge, MA 02238 (include $1 postage with your order). Make sure to check with your local comic shop before ordering. The Very Vicky Happy Hour Collection: This is not a trade paperback, but a collection of the first five issues of Very Vicky, with a full-color, signed pin-up. If your local comic store is serviced by Diamond, Capital City, or Heroes World, then you can get your sweaty little hands on this collection. Miscellaneous: Very Vicky has popped up in a few odd places recently. An original Very Vicky preview was published in Cerebus #187, and GASP (Giant Anthology of Self-Publishers) contains an all-new Very Vicky short story, as well as work from fifteen other self-publishers. All-new Very Vicky cartoon strips are also published in the quarterly Boston arts paper Etcetera. The Very Vicky Junior Hepcat Squad: You can join the ranks of the Junior Hepcat Squad (along with well-known creators Steve Bissette and Dave Sim) for the small fee of $2.50 (sent to Meet Danny Ocean at the above address). When you join, you get o membership card, games, a newsletter, and drinking tips.